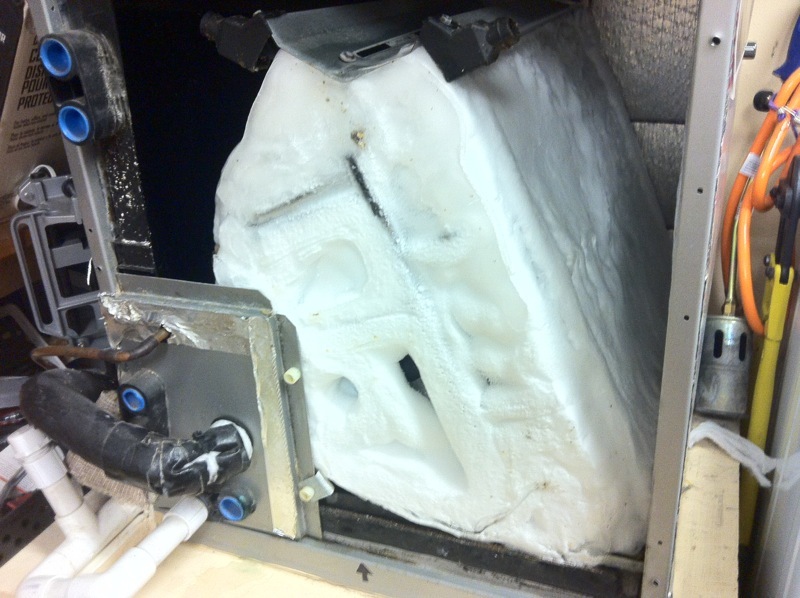 Why Is My Air Conditioner Frozen On the Inside? So you’ve noticed your AC’s been struggling to cool your home. After some investigating, you find that your AC’s indoor evaporator has completely frozen over. Don’t worry. We’ll show you how to determine which one is your problem and what you should do to fix the problem. But first, make sure you follow the next 3 steps immediately…. Got it? Good. Now it’s just a matter of waiting for your air conditioner to thaw out and cleaning up the melted water right away. IMPORTANT: Don’t run your AC until you’ve determined the issue and resolved it. Now let’s take a look at the 2 possible reasons your AC is frozen. Your air conditioner uses very cold refrigerant to absorb heat and moisture from the air inside your home. This heat exchange takes place at the evaporator coils (the part that’s frozen). And as warm air passes over those cold refrigerant coils, the coils absorb enough heat to prevent them from freezing over. But if there’s not enough warm air passing over the evaporator, the refrigerant-filled coils will continually drop in temperature. And as the moisture in the air collects on the freezing coils, ice forms. Dirty, clogged air filters. Check and change your air filter when it looks like the filter to the right in the picture below. Blocked return vents. Make sure no drapes, furniture, etc. are blocking any return vents. Keep objects at least 2 feet away from return vents for proper airflow. Closed supply vents. Keep all supply vents open, even the ones in rooms or areas that aren’t being used. If you’ve checked and aren’t guilty of these 3 problems, you’ll need a professional to inspect your system for the following problems. Remember how we explained that your AC uses refrigerant to absorb heat from the air inside your home? Well, your AC system needs a certain amount of refrigerant to work effectively. But over time, wear and tear on the refrigerant coils can lead to refrigerant leaks. And when there’s not enough refrigerant in the system, the temperature of the refrigerant coils drop and eventually ice over. One way to tell if your AC has a refrigerant leak vs. low airflow is to listen for a soft hissing sound anywhere along the refrigerant coils. You won’t always be able to detect this hissing noise, but if you do, you know you have a refrigerant leak. Unfortunately, if your AC has a refrigerant leak, you’ll need a professional to come inspect the system. Only licensed professionals can handle refrigerant since it is a toxic chemical. A professional will locate and repair the leak and then recharge your system with refrigerant. If you have a frozen AC unit and need professional help, just contact us. We’ll be able to determine what’s wrong with your system and get it repaired as soon as possible.